In this Kansas wheat trial, Titan XC provided a yield and ROI advantage when used with a banded dry fertilizer application. Titan XC was applied at 1 and 2 pints per ton on MicroEssentials SZ (MESZ), which was placed in-furrow. 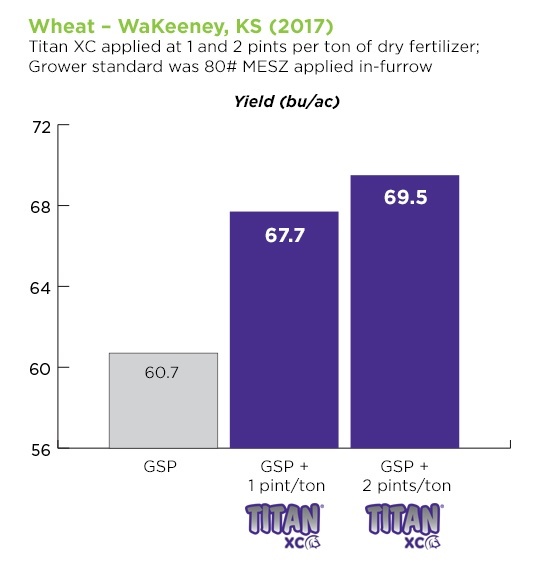 Compared to the untreated MESZ, both rates of Titan XC raised wheat yields, with a 7 bu/a yield increase at the 1 pint rate and an 8.8 bu/a increase at the 2 pint rate. With wheat prices estimated at $3.75/bu, the return on investment with Titan XC in this trial ranges from $24.55 per acre (1 pint rate) to $29.60 per acre (2 pint rate). Learn more about using Titan XC to maximize the efficiency of dry fertilizers by watching our recent webinar.